My sister let my husband and I stay at her beach house during a hockey tournament. 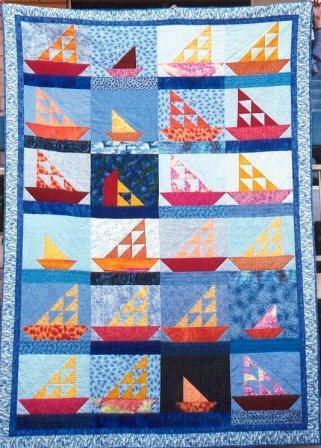 To repay her kindness I gave her a "boat quilt". 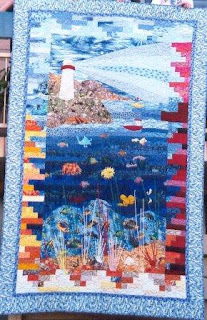 As her children were my yongest nieces and nephews at the time I decided to make them a quilt also along the beach theme. I had them draw pictures of what the beach was to them. They were 4 and 6 at the time. I then used their drawings to make edge applique pictures to put on their quilts. One represents the lighthouse and the steps up to their unit. The other the beach and the games they played. As my mum would often stay with them I also made her a quilt with fabrics that were left over from the other three quilts. 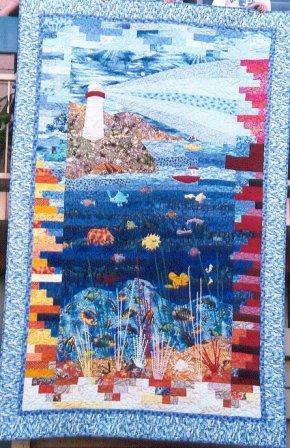 They all have the same fabrics in the borders.